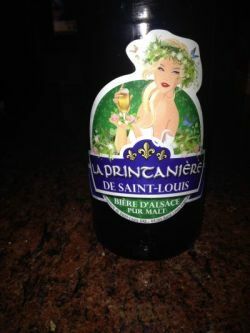 This is the spring beer from St Louis brewery. See http://saint-louis.biz/ for details. The new name is "La Printanière"
UPDATED: JUN 20, 2015 pours clear golden colour with a white head and little lacing. floral hoppy aroma. oily texture. nice lingering bitterness on the palate. Bottled 33cl. Courtesy of jaghana. Clear deep golden with a tall white head. A huge amount of diacetyl in the nose. Malt accented. Medium bodied. Decent bitterness. Some sticky chunky lace. Reminiscene of caramel, butter and earthy hops in the finish. Poor. Thanks jaghana! bottle, SuperU Gambsheim. Cloudy orangey-golden colour, large white head. Perfumy floral hoppy nose. Light-bodied, shy malty base, yeasty, lots of floral and perfumy hop flavours. A very nice beer for a warm Sunday in spring. Bottle 33cl. A slightly cloudy golden beer with medium head. Nose is hopy and resin like. Aroma is medium sweet, very hopy on floral and resin side, medium malty, with caramel malt, some diacetyl too, very nice hops bitterness, a good beer.